Several years ago, we linked to a wonderful set of alphabet letters styled to look like baseballs on Activity Village. But in the last year or two, the link broke and the alphabet disappeared on their site. We were sad to see it go, but forgot to remove the link… until today when I got a note through our contact form from a reader asking us, “Where the heck are the baseball alphabet letters?! I WANT THEM! !” I was about to reply and tell them they were out of luck… until I thought: DUH. Why don’t I just recreate them myself? So I did! I’ll share up front that if I can ever locate the original set again, I’ll be happy to send visitors back their way. 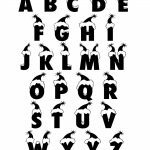 But for now, here’s the new alphabet! 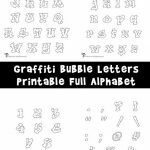 Since we have had printable bubble letters for over four years now, our readers have used them for so many projects – lots of students use them in their school projects for presentations and banners. 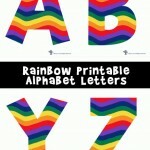 Others use them as embroidery patterns, or even as sewing patterns for alphabet initial pillows. 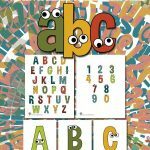 You could also use them for any crafts you want to personalize with someone’s name, or use a projector to trace the letters onto a wall or piece of furniture to paint words in a mural. Got any more ideas? Leave them in the comments below! !